A comment on a prior post got me to thinking, how bad was Georgia's defense? I know we finished 32nd in the nation, but when you also finish 6th in your own conference, there is room for debate there. So, our two worst games, from a YPP perspective were Kentucky and SC. I our two best were Florida and Georgia Tech. I realize that YPP might not fully capture the nature of a defensive performance, so I also thought I'd look at scoring defense. Again, nothing too earth shattering. Not sure you can read too much into this, other than we held 9 of our 13 DI opponents under their season average and held three of our biggest rivals to more than 2.5 TDs below their season average. So, I know you are about to go on about rushing. Rightfully so. We were not good at run defense, particularly against teams that already run the ball well, right? Little side note, Nebraska, Alabama, Gerogia Tech, Kentucky, South Carolina, Tennessee, Florida Atlantic, Missouri, and Buffalo ran the ball more times than their season average against Georgia. Alabama did so 12 times more than their season average. I suspect part of this has to do with keeping Georgia's offense off the field. I know part of it has to do with teams deciding that running the ball was the better way to move the ball on Georgia (as we were ranked top 10 in pass defense). 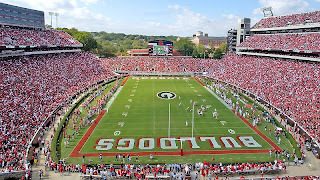 Actually that bore itself out over the season, as Georgia faced the fourth fewest pass attempts per game in the nation. Georgia faced more rushing attempts than 115 teams. Teams decided that the only way to beat Georgia was to run the ball. The only real fault I can find is the 4.14 yards per carry Georgia gave up. That put us in the mid-60s in the nation. Four teams scored more than their season average. One team score more than a TD more than their season average. Three teams had more ypc than their average. Only two teams ran for substantially more ypc than their season average. Four teams scored 2.5 TDs fewer than their season average. We were thoroughly average at yards per carry nationally. I'd say overall, Georgia's defense had three bad games: South Carolina, Tennessee and Kentucky. They had two slightly below average (considering the competition) games: Buffalo and Florida Atlantic. They had several average games, including Alabama (except for their yard per carry) and Nebraska. When you consider seven of Nebraska's points were on a gimme interception return, seven of South Carolina's points were on a punt return, seven of Tennessee's points were on a interception return (plus the Vols got two turnovers inside of the 20 yard line that were converted into TDs), and FAU had a TD returned for a TD, those games aren't as bad. Hell, looking at the Tennessee game, in hindsight the offense is closer to being at blame for what happened there, especially on the scoring side. Nothing about this season made me think we had a terrible defense. Yes, even with the talent we had. Could we have done more? Certainly. Could it have been worse? Always. Just understand what we are talking about when you start with the Grantham should just leave non-sense line.